Surrounded by 36 holes of championship golf, the Leadbetter Golf Academy and 15 acres of recreation, Omni Orlando Resort at ChampionsGate allows you to experience a true luxury retreat. The resort offers easy access to attractions like Walt Disney World, Universal Studios and SeaWorld. Experience the all new, three-story Sunset Lodge & Suites featuring 93 rooms, comprised of studio suites with a sofa, two double beds and a kitchenette, equipped with a refrigerator, microwave and sink. Connecting rooms feature one king or two double beds. The expansive recreational area is an oasis of activity and relaxation with an all new wave pool, kids’ interactive pool with slides, adult-only pool, and zero-entry family pool. Grab a tube and ride the 850-foot lazy river, escape to one of 23 private cabanas and then sharpen your game on the Champions 9, Par 3 Golf Experience, lit for nighttime play. Welcome to your New York residence. You can’t get many more favourable locations than Omni Berkshire Place, slap bang on 52nd Street between Madison and 5th Avenue in the heart of Manhattan, providing rapid access to the best of the Big Apple. Beyond the front doors Fortune 500 companies are strewn across the neighbourhood, well-heeled shoppers flock to 5th Ave and theatre and historical attractions are within easy reach. That’s not to mention New York icons such as Central Park, Times Square, the Rockefeller Center and the greatest musical theatre anywhere in the world are less than a cab ride away – they’re on the doorstep. The hotel’s Apartment Penthouse is the foremost accommodation option. Inspired by the high fashion of New York design, the expansive space is light and bold, featuring intricate textures, tailored design and curated art, with the true feeling of a lavish New York home. Modern, en-vogue and timeless, it offers a large living space with a study and separate dining room that opens out to a private terrace with stunning views of the city. Bold curated art pieces and new pieces by rising artist Hayley Mitchell adorn the suite, which includes a master bedroom, dining room, bathroom and lounge area. To fuel up for exploration, travellers can enjoy hearty American fare in Bob’s Steak and Chop House and Bar for an authentic dining experience featuring oversized cocktails, prime steak and seafood and decadent desserts in a lively atmosphere. And take five next to 5th Avenue to enjoy St. Patrick’s Terrace, located on the 17th floor across from the fitness centre, showcasing views of St. Patrick’s Cathedral. Enjoy yourself and leave the details to the dedicated team, so you can focus on the more important aspects of your stay. 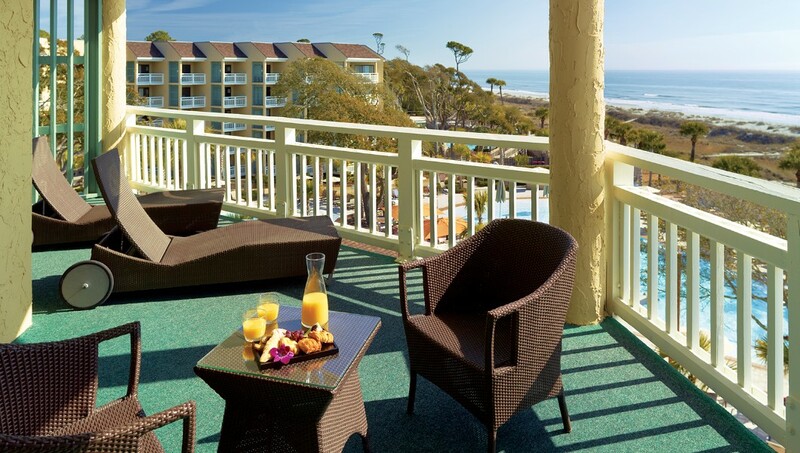 Omni Hilton Head Oceanfront Resort boasts an elegant contemporary design throughout the property’s spacious guest rooms, public areas, meeting rooms and the unmatched white sand beaches joining the cool blue Atlantic Ocean. Tropical gardens run throughout the Hilton Head beach resort, providing a serene and tranquil place where you can choose from a variety of activities during your stay. Palmetto Dunes is also home to three championship golf courses by designers Robert Trent Jones, Arthur Hills and George Fazio. If you prefer relaxing on the beach, the resort offers private access to the beach for your enjoyment. Spend your days soaking up the sun on the white sugar sand beaches, play in the ocean on a Fun Cycle or catamaran, round up some friends for a game of beach volleyball, or simply take a leisurely stroll down the beach as you enjoy watching the sun rise over the Atlantic Ocean. SPECIAL OFFER: Experience Hilton Head Island during the 12th annual Seafood Festival with a package that includes accommodations for two and access to special events.